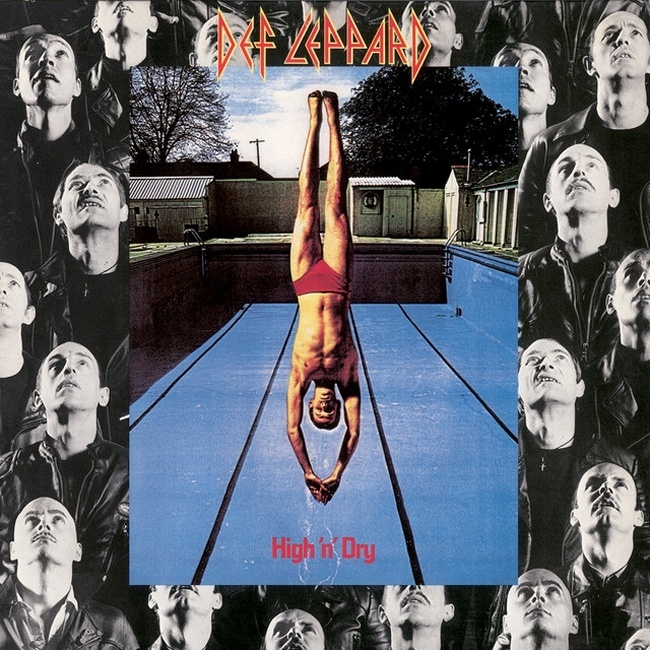 Def Leppard released their classic second studio album High 'n' Dry on this day in 1981 in the UK. The follow up to On Through The Night was released on 6th July 1981 just ahead of their UK tour which ran from the 13th to the 25th. It was the first time the band would work with legendary producer Robert John 'Mutt' Lange. And the album which established the band's trademark sound, introducing them to a wider audience. Featuring their first "hit" single in 'Bringin' On the Heartbreak' as well as other songs that still feature in the live show in 2017 in 'Let It Go' and 'Switch 625'. The album was later released in the USA and Canada on 21st July (according to the RIAA) and would reach Number 38. It peaked at Number 26 in the UK charts. The second studio album released by the band following their first world tour which had ended in October 1980 in Europe. Soon after the band began writing songs in Sheffield before embarking on a short club tour of the UK in December 1980 to road test some of the new songs. Side One of the album would played live in sequence for the first time in Kanazawa, Japan on 18th November 2002 during the first leg of the X/Ten world tour. It would be played many more times in 2002 and in 2003 and only once in the UK (28th October 2003 in Cambridge). Side One would be brought back into the set for the 'Ded Flatbird' segment of the 'VIVA! Hysteria' residency in March/April 2013 and captured on the DVD filming. 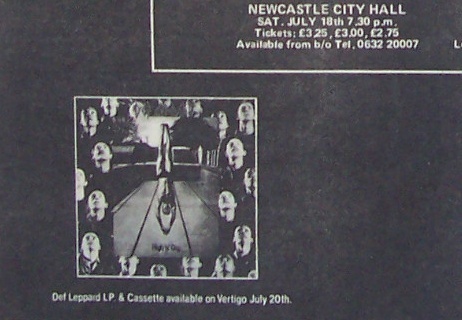 The album was written in late 1980/early 1981 back home in Sheffield following a short break after the end of the 1980 tour in December. Having been made to wait for a few months the band met up in London with Producer Mutt Lange and recorded the album at Battery Studios in Willesden, North London from March to June. Mutt Lange helped to change the band's sound and took them from an ordinary run of the mill NWOBHM band onto a different level. This was highlighted by the song 'When The Rain Falls' with Mutt taking the guitar riff and helping them transform it into 'Let It Go'. Something that would also be done on the next album with 'Rock! Rock! (Till You Drop)' (Medicine Man) and 'Too Late For Love' (This Ship Sails Tonight). 'Let It Go' was also the first song to be recorded and the first time the band would work with the late Mike Shipley and fellow engineer Nigel Green. Both of whom, would go on to play integral parts in the 'Pyromania' and 'Hysteria' albums. The original vinyl record had the NO, NO, NO... ending repeated about 30 times until the record finished playing with no fade out. Both 'Let It Go' and 'Bringin' On The Heartbreak' were issued as singles in the UK with live promo videos filmed in Liverpool during the July UK tour. As yet no evidence has surfaced on the band actually performing BOTH live during the 1981 tour. 'Let It Go' was the only US single and reached Number 34 on the Rock Chart. The cover art saw the band team up with Hipgnosis, led by the late Storm Thorgerson, for the first time. Various Pink Floyd websites suggest the artwork was originally designed in the 1970s. Storm had (apparently) intended to use the artwork for two Pink Floyd albums in the late 70s but it was rejected and ended up fitting the title of Leppards album. "Mutt was not present at the band's 1980 songwriting sessions in Sheffield. 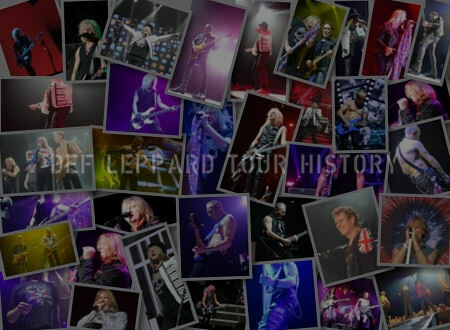 Leppard had set up shop in the paper factory there with a Fostex deck and a Teac four-track recorder, laying down rough versions of the compiled material. A couple of those demos made their way to London for Mutt's consideration. Then in March of '81, Leppard relocated to a rehearsal space in North London, down the street from a women's prison , ready to start pre-production. On the very first day, Mutt walking in looking like Robert Plant, according to Joe, sporting long wavy blond hair and wearing a heavy trench coat." "He introduced himself and said 'Right, let's get started then. This song you do When The Rain Falls - play it faster.' So we played it for him, faster than usual. Then he said 'Play it slower.' Then it was faster. He asked me to sing a different melody, to change the meter. This went on and on. And eventually that song became Let It Go." 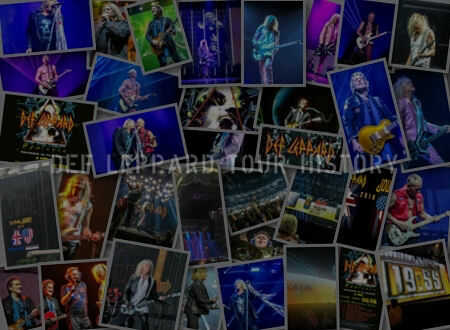 "Mutt was quite happy with a number of the songs essentially as Leppard had written them. There were a few significant changes made on Another Hit And Run and No No No. 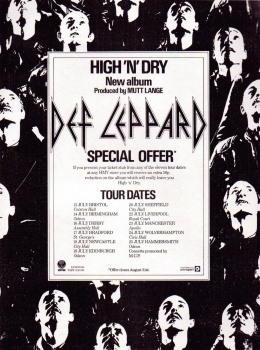 High 'N' Dry (Saturday Night), on the other hand, was practically unrecognisable from the song Leppard brought down from Sheffield." "I wanted one song on the album to have a kind of Highway To Hell feel - no bass to start with, coming in stages," Mutt relates. "We got a groove going for the verse, and then tried to figure out where we wanted to go with it. We'd throw ideas around, these basic feels, sing them and then have the guitarists play them to make them sound a bit more credible. Once the verse was in shape, we worked on the chorus. It had to be a real anthemic sort of thing." "In retrospect, the actual time spent at Battery Studios (Mutt's studio of preference) cutting High 'n' Dry. was only about two months. The band started in April and, according to Peter Mensch, the last overdub was recorded on June 11, after which Mutt invested another couple of weeks for mixing. But the process of recording each instrument and vocal individually subdivided into sections, was a bit more arduous than Def Leppard were used to. Those two months, at times, seemed like years." The album was not released in mid June as Twitter would have you believe. The recording was actually finished on 11th June and so this was not the release date. The date of 11th June actually comes from 'Animal Instinct' and was itself a mistake. A quote that the album recording had been completed on that date. It had actually been completed on 10th June. Joe recording vocals for 'Me And My Wine' before travelling to Germany for a show on the evening of 10th June 1981. Joe was pictured with the finished album sleeve a day later on 11th June in Paris. 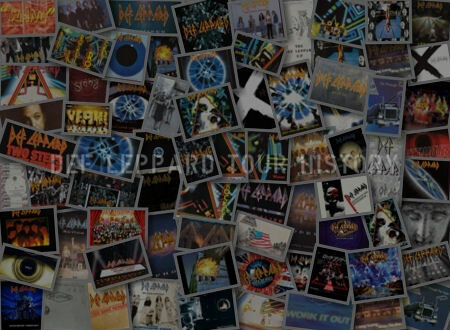 All official discographies from 1987 to 2005 printed the release date for the album as "July 1981". It was not until the 2006 YEAH! tour programme that it was listed incorrectly as 11th June. A mistake which has been repeated online...only with 11th July. That tour prog does mention 11th July but only for Pete Willis being fired. 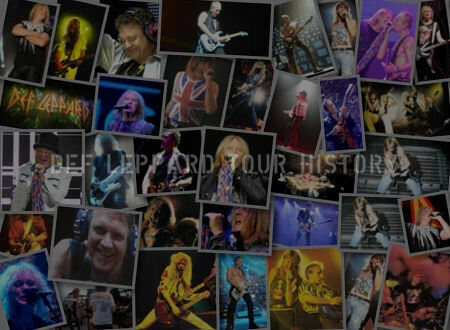 One example shown above is from the 1994 'Action' discography with a preview note for the proposed 'Official Def Leppard World-Wide Discography' which had been due to be released in 1995 but never was. 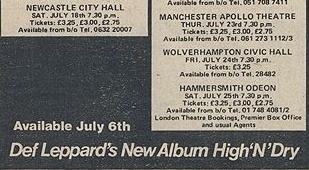 Some UK tour adverts in the UK press at the time also list the 20th July as a release date. Including one major UK music magazine dated 11th July 1981. It's unclear if this was a mistake or the album was actually pushed back. One week from release to a chart entry does not match other albums at the time. However that date does not tie in with it's chart entry date (three weeks after the 6th July release date) which is in keeping with other UK releases of the time. 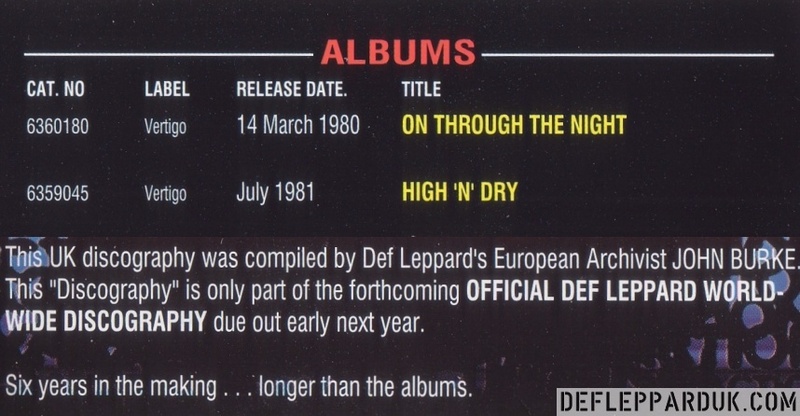 Note - The 11th July 1981 was a Saturday and therefore not the release date of the 'High 'n' Dry' album. It was released on 6th July in the UK and 21st July in USA/Canada. The 11th July date was posted randomly years ago on Wikipedia and has not been updated since. "He's not the best singer I've ever heard but he shows promise. I'd like to do their next album." "Because we wanted that kind of reaction from it really. And it's like having two titles tracks on one album. It wasn't a leftover from the first album. We just thought it was a good title to use for a song. So it was really Steve that was nagging me to do it. So I did it."